At the end of the Seven Years' War, following Britain’s decisive victory, several successive ministries implemented reforms in an attempt to achieve more effective administrative control and raise more revenue in the colonies. The revenue was necessary, Parliament believed, to bolster military and naval defensive positions along the borders of their far-flung empire, and to pay the crushing debt incurred in winning the war on behalf of those colonies. The Newport, Rhode Island area has a long and interesting local history, and since 1741 the town's tradition has included the Newport Artillery Company, the oldest continuous commissioned military unit in the United States. The company was formed under the terms of a charter granted by King George II of England, and the formation of the company. Between the end of the French and Indian War (1763) and the Declaration of Independence (1776), Rhode Island was sharply divided into Loyalists and Patriots, caused by the Great Britain's desire to assess taxes and station permanent garrisons in the colonies. Some of the colonists, accustomed to local rule, desired neither. In general, the prominent landowners, especially those whose holdings were based on royal charters, remained loyal to the King, while the merchants and small farmers were in the Patriot camp. The Rhode Islanders were especially irritated by the British customs laws and the efforts to enforce them. The British Government stationed the Gaspee in Newport harbor to collect taxes at gunpoint from every vessel that entered the harbor. More than half of all Rhode Island vessels were engaged in smuggling tea, which meant that every ship would be in danger. The bay had many coves and inlets and many of them offered ideal cover to seamen determined to thwart London's Acts of Trade and Navigation. In February 1772, Lt. Dudingston sailed the Gaspee into Rhode Island's Narragansett Bay to aid in the enforcement of customs collection and the inspection of cargo. Rhode Island had a reputation for smuggling and trading with the enemy during wartime, and Dudingston and his officers quickly antagonized powerful merchant interests in the small colony. This incensed the seafaring citizens of Rhode Island. The Gaspee crew was even ordered to take supplies from area farmers without permission or compensation. When news of these actions reached Rhode Island Governor Joseph Wanton, he called for a meeting with Lieutenant Dudingston to voice the residents' concerns. Upon arrival in Providence, Captain Lindsay alerted officials in Providence to the Gaspee 's mishap, a town crier was sent out inviting all interested parties to a meeting at Sabin's Tavern to decide on a course of action. The majority of these men, who comprised the social elite of Providence, were disguised with black-smeared faces or Indian headdresses. Led by John Brown, a wealthy merchant and member of one of Rhode Island's most prestigious families, their intentions were nothing less than the deliberate destruction of the government ship on duty in Narragansett Bay. 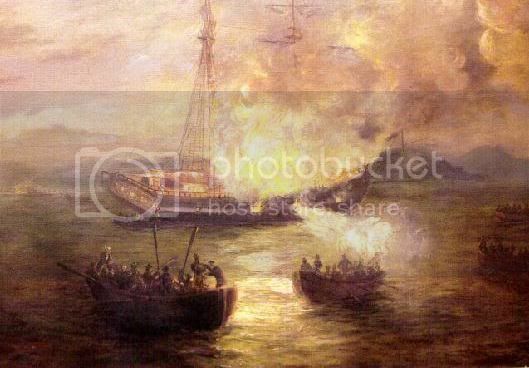 The colonists rowed away with their prisoners, leaving one boat and the leaders of the expedition – prominent men of Providence – who removed most of the documents aboard the ship, and ordered Gaspee to be burned, and the vessel burned to the waterline. At the break of dawn on June 10, 1772, the ship's powder magazine exploded, and the Gaspee sank, utterly destroyed. Lt. Dudingston was later moved to the home of Mr. and Mrs. Jahleel Brenton at Newport, because it was thought to be safer there. He stayed at their home during the early part of his recovery from his wounds. He spent several weeks recuperating at their home, and a marine guard was stationed outside Brenton's house until Dudingston was well enough to travel. The Brenton family was a prominent one in Rhode Island. Its founder, William Brenton, emigrated from England to Boston in 1633 with a commission to survey land for Charles I. Finding Boston's religious atmosphere too intolerant, Brenton continued on to Providence, where he purchased the Island of Rhodes (Aquidneck) from the Indians through the agency of Roger Williams. Brenton established the town of Newport, which soon became a prosperous trading community. His grandson, Jahleel Brenton, who held 2000 acres of land on Brenton's Neck and who participated extensively in Newport's profitable commercial enterprises, was one of its most prominent citizens. No further local investigation of the Gaspee incident took place. When the General Assembly met in August, its members approved of the actions that the Governor had taken and authorized him to continue the investigation in whatever manner he considered to be appropriate. Governor Wanton didn't make an effort to discover or prosecute any individuals.